"Like" token, awarded by mooncaine. As I'm currently rigging a cat, I have some suggestions/fix to bring about the cat setup of Rigify 0.5. When the ears need to go down (i.e. 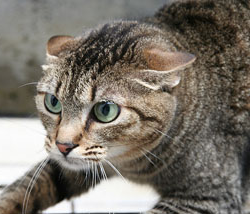 for an aggressive expression), most of the cat's ears fold back on itself on the outer edge of the ear while the inner edge remains straight or slightly bent. It's far from perfect but it may be an idea of improvement. The downsides of that "reversing" workaround are that the main ear bone (used for rotation and location of the whole ear) is now on the wrong side of the ear, the inner edge of the ear have bad deformations and it doesn't have anything to give it a nice bending for this kind of pose anyway. This cat rig ears can be improved I think. The Spine's and tail's tweak controllers are for now stored in the Face (Primary) layer. I think these should be stored in the Spine and Tail layers or even have their own as they are Tweak bones. The Breast.C bone and ORG-Breast.C bone are for now parented to the root bone. Which means that the breast floats in the air if the body is moved in any way. Unlike belly.C and ORG-belly.C which are parented to ORG-spine.003 and follow the body correctly. Anyway, thanks for this awesome setup, it saves me a huge amount of time ! The only bug i can confirm is misplaced tail tweak layers. It seems i forgot to set the spine property correctly. This is an easy fix even for the user, just select the bone in pose mode and in the 'Rigify Type" tab just deselect layer 2 and select layer 5. 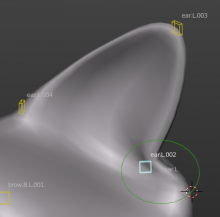 This will enable the 'spine tweak' layer in the rig ui and place the tweak bones accordingly. in the predefined metarig this is not happening. You have probably unparented those bone by mistake. Can't really see the benefit of this. The face sample is going to be completely re-designed anyway. Moreover this should be probably intended more like a feature request rather than a real bug. Will take care of it in a possible redesign. In the while as you did the user can customize the metarig as preferred. This is how rigify is designed to work. Since after a month no issue is reported and can't reproduce the breast problem I am closing this task.